FIU architecture students celebrated two decades of Walk on Water, a class assignment-turned-annual contest, on Wednesday, Nov. 3. Most of the two dozen or so students stepping into creatively buoyant contraptions to cross the 175-foot lake behind the Green Library were part of professor Jaime Canaves’ Materials and Methods of Construction class and were participating in hopes of getting an “A” and the $500 first place prize. The contest, however, was open to all students. 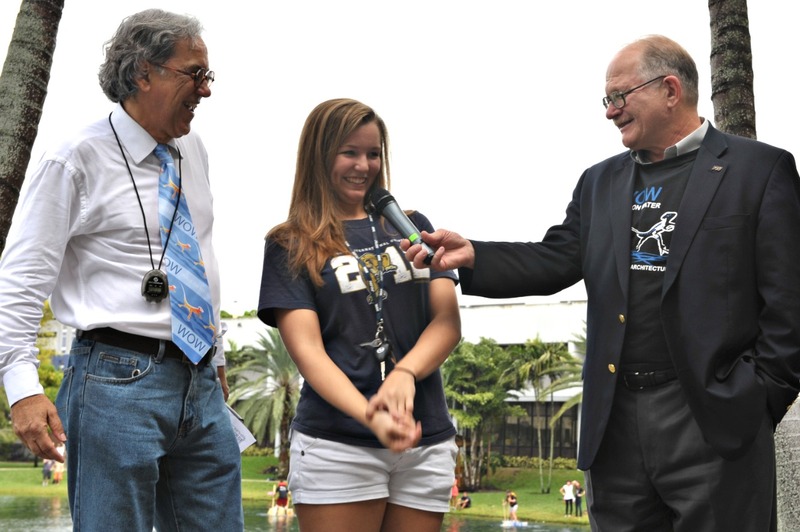 Cristina Fernandez shares a laugh with President Mark B. Rosenberg and Prof. Jaime Canaves after winning Walk on Water.